Do you remember my description in the recent PulpFest report about how a dealer showed me a copy of my 1982 tour book in gray wraps which he had priced at $15? I was going to put it back for some prospective shopper, but figured, hey, it’s cheap, may as well buy it. One of the things that tipped me toward saving it from oblivion was that, while the book wasn’t signed or inscribed to anyone, it did have as an insert a letter I had written on Bouchercon-by-the-Bay stationary. In fact, the price sticker on the plastic bag had the note: “w/ signed letter $15-.” I waved it around so John Haefele and Morgan Holmes and Tom Krabacher could see it was a letter from me, then placed it back inside the book. That letter was done on a typewriter, so as far as I know I may well have a carbon copy of it lost in a file box somewhere. I only glanced at it quickly at the time. 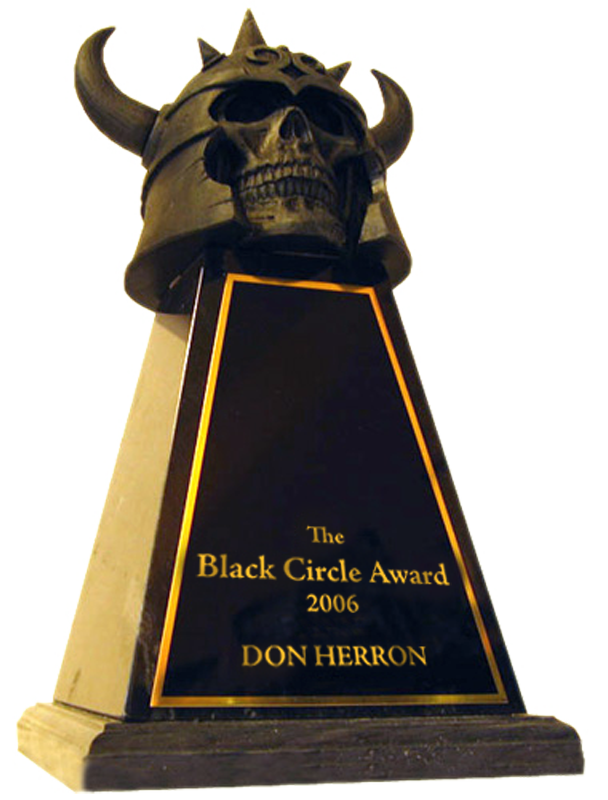 Seemed to be to a photographer — my thought was that maybe someone had taken a few shots used for a magazine article about that Bouchercon I was chairman of, or something, and I had dropped an acknowledgement. About three weeks ago I finally sat down and read the letter — to a Mr. Marcus, dated September 17, 1982. Didn’t take me long to understand the context once I got into it, because a few years ago I came across the envelope he had sent with a photo he took on one of the 1982 walks. 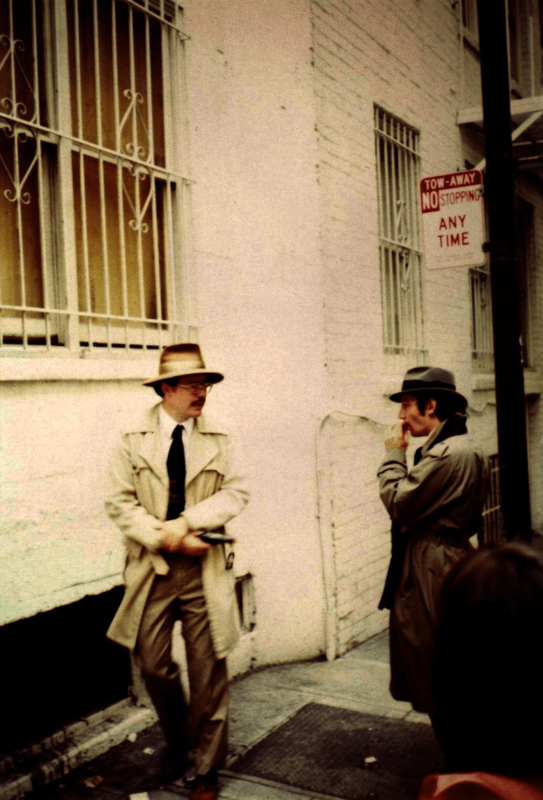 Scanned the photo at the time — which as you can see shows a scene from thirty-three years ago, where deep in Burritt alley you have photographic evidence of the earliest meeting of Don Herron, left, and Bill Arney, right. When I first came across the photo, I didn’t know it would have Bill — now The Voice of Noir — in it. Man, what are the odds that someone would have snapped that shot at that moment? That fellow, by the way, came to the following meeting of the Maltese Falcon Society — seems he had never read Hammett, had never seen the Bogart “Maltese Falcon.” His parents had given him the trenchcoat for some reason, a friend had given him the hat! I think Bill has touched up his proto-Hammett fan bio a bit more recently. I think he now says that he had read Red Harvest already, before taking the tour, and he maintains the hat and trenchcoat made perfect sense, with a rainy winter in Frisco coming up. I can only relay the impressions I had in that era, as recorded in that letter. But what are the odds that I would fly to Philadelphia, then to Columbus, Ohio, and find a letter that mentions the first moments in Hammett fandom of no less than Bill Arney? If there is a Hammett Cult in San Francisco — and there is — Bill is a pillar. As am I. 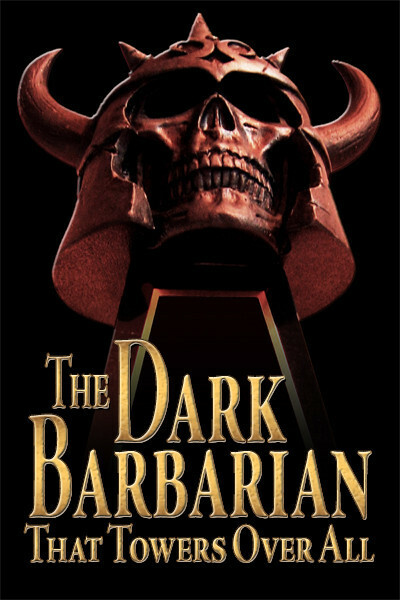 This entry was posted in Dash, Frisco, Tour and tagged Bill Arney, Burritt alley, Hammett Cult in San Francisco, John D. Haefele, Morgan Holmes, PulpFest, Red Harvest, Tom Krabacher. Bookmark the permalink.